An amazing finish to the 2013 college football season, and an amazing performance in what has become the marquee game on the first Saturday in December, the SEC Championship Game. 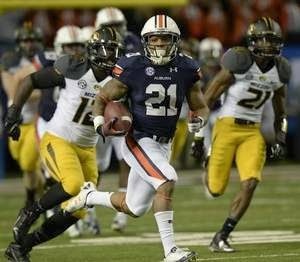 Auburn running back Tre Mason put his team on his back, and ran them all the way to the BCS Championship Game, the second in four years for the Auburn Tigers. Mason gashed the Missouri Tigers for 304 yards and 4 TDs on the way to a video game-like 59-42 victory for Auburn. Remember when the SEC was all about defense? Well it ain't anymore, and LSU and Alabama are now playing catch up. Congratulations Tre Mason, you are the Longhorndave Sportsman of the Week!